Audi Q5 Boot Space, Size, Seats | What Car? You won’t be short of space in the front. The seats move far enough back to afford anyone tall plenty of leg room and the high roofline provides an equally generous amount of head room. Storage space is abundant. Each front door has a sizeable bin that’s shaped to fit a large bottle and there are a couple of cupholders between the driver and passenger for your takeaway coffee. You’ll also find a small cubby for loose keys in front of the gearlever and a bigger storage cubby underneath the front armrest. Oh, and there’s a good-sized glovebox, too. The two outer rear seats offer loads of head room and a decent amount of knee room for those long of leg – but not quite as much as in a Volco XC60 or Land Rover Discovery Sport. There’s enough width for three adults to sit side by side in decent comfort – although, again, the middle passenger won’t be quite as comfortable as they would be in the rear of the XC60 or Discovery Sport. That's partly due to a high central floor tunnel that eats into foot space, while the protruding rear roof light pinches a bit of the middle occupant’s head room. And if you want seven seats, you’re out of luck. Of the Q5’s premium large SUV rivals, only the Discovery Sport offers that convenience; there are, of course, non-premium seven-seat options as well, such as the excellent Peugeot 5008. Storage options in the back include a couple of decent-sized door bins with space for a litre-sized bottle and, if you add the relatively cheap Storage Pack, you'll get nets on the backs of the front seats and two cupholders in the central rear armrest. 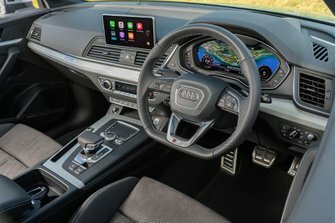 The Q5 offers plenty of seating permutations. As standard, you get folding rear seats that are arranged in a 60/40 split. These are easy to drop, thanks to a couple of handy levers placed just inside the tailgate opening. Sliding and reclining rear seats (named Rear Bench Seat Plus on the options list) are something we’d recommend – for three reasons. The recline feature is a bonus if your rear passengers fancy a snooze, they afford you the option to slide the rear seats forward, increasing the boot’s capacity, and they add a more flexible 40/20/40 split/fold arrangement. 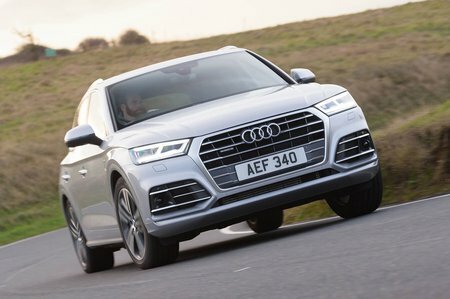 While it’s a shame that this doesn’t come as standard on most versions (only on the Vorsprung and SQ5), it's not an expensive option and it's one that isn't matched by rivals like the XC60 or Mercedes-Benz GLC. Meanwhile, the front passenger gets an array of adjustments, including seat height and electric four-way lumbar adjustment. Full electric seats are standard only on the poshest trim levels. Audi fits a powered tailgate to all Q5s, so all you need to do is press a button to open it. In fact, if you upgrade to the optional hands-free opener (standard on Vorsprung trim), you don’t even have to do that – just waggle your foot under the rear bumper and it opens. At 550 litres, the boot volume matches that of rivals such as the GLC and BMW X3. And with no intrusions from the wheel arches, it’s a useful, square shape that’s easily large enough to swallow a fold-up pram or up to nine carry-on suitcases. That’s one more than an XC60; we know because we’ve tried it. 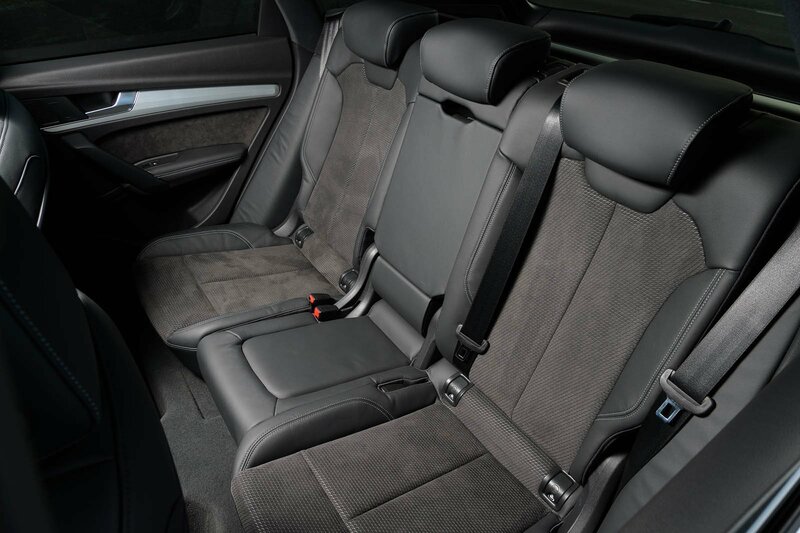 If you go for the Rear Bench Seat Plus pack option (it's standard only on the SQ5 and Vorsprung) you get sliding and reclining rear seats that, when slid all the way forward, increase boot space to 610 litres – placing it among the very biggest boots in this class.